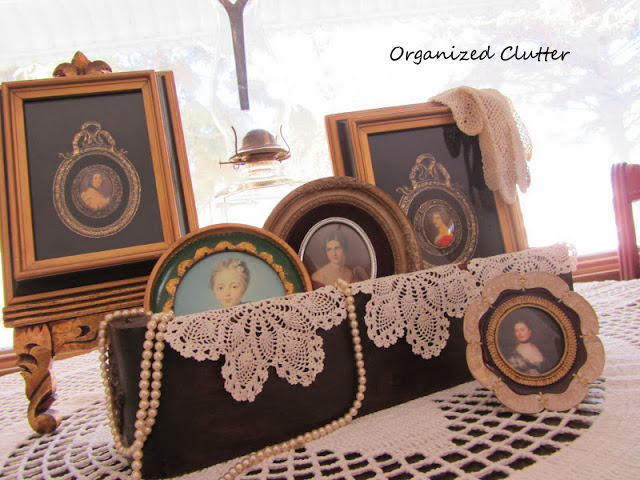 I collect lady portrait plates (displayed in a prior post), lady headvases, lady figurines, and lady framed prints/pictures. Someday, when I have my dream lady bedroom, I will decorate with my ladies and very, very feminine fabrics, colors, and accessories. 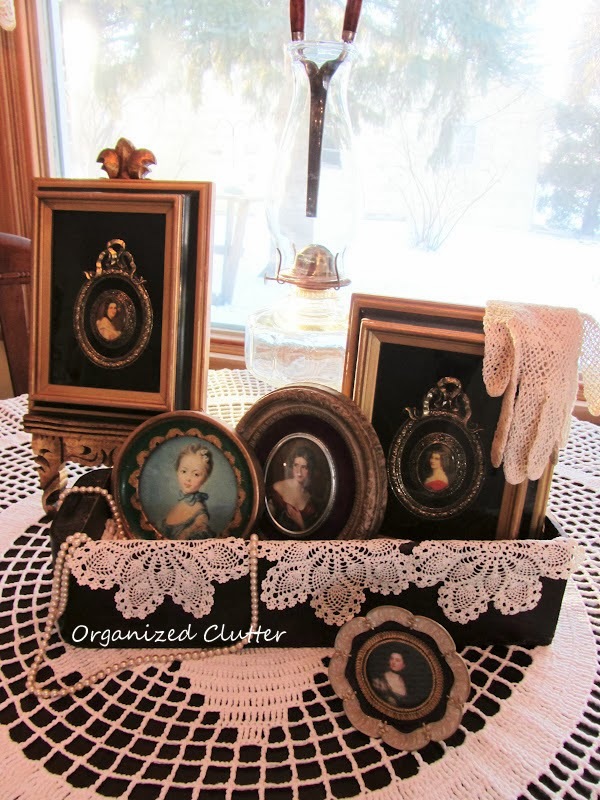 Since my vintage sewing drawer was already out displayed with a Valentine vignette, I re-filled it with Victorian Lady Framed Art. Victorian women were feminine, beautiful, and proper. Some of these pics are vintage, and some recent reproductions. I hope my photography skills will improve soon. My poor oil lamp and vintage curling iron are very hard to see. I did try it with the blinds down too. Not much better. What a wonderful vignette! I am visiting from the Cozy Home Party and plan to take a look around your blog for your Victorian Lady framed art. I love the pictures in the box. You are very creative. I never would have thought to do that, but I love the look. One thing that I've found that helps with pictures is to have the sun facing what I want to take a picture of. When the sun comes from behind, it makes what you're taking a picture of darker. Just moving the vignette around the table so the light will stream in from the side may help the next time. Hope that helps with your picture problem. Thanks for linking up to the Your Cozy Home Party this week! Your ladies are lovely. Your vignette is so pretty! Such a beautiful vignette!! I think I pinned this on Pinterest last night!! You have a great collection of Victorian ladies. Really like how you have them displayed with the gloves, lace and pearls! Your precious Victorian collection is stunning, I love them all. Very pretty! 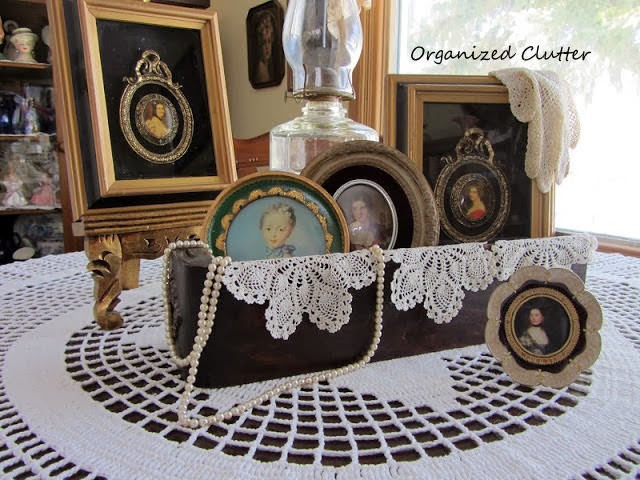 I really like the way you have the beautiful ladies displayed in the old sewing machine box, such a nice touch with the lace and pearls too. Such a pretty vignette!! Right up my alley with the Victorian Ladies!! What a great and lovely collection! I would just be okay with one because I love them so much. Gorgeous vignette and collection. The Victorian era has always held a fascination for me. The way you 'lined' the drawer with the doilies is so pretty. Hi again Carlene. Just a quick message tonight to say congrats! Your wonderful vignette was chosen as one of my Saturday Picks from my party this week. I'm so glad you shared your post so other people can get some inspiration for how to decoration with their collections. Hope you're having a wonderful weekend! This is very charming and pretty! Love it!